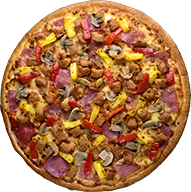 Richly decked with nine delicious toppings - beef, ham, italian sausage, pepperoni, seasoned pork, bell peppers, mushrooms, onions, and pineapples. 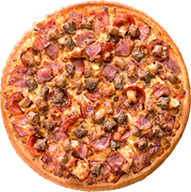 Enjoy a protein-packed serving of bacon, beef, ham, italian sausage, pepperoni and seasoned pork. 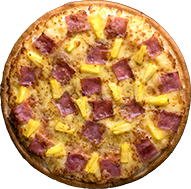 Say 'Aloha' to our all-time favorite with double layers of ham and pineapple! 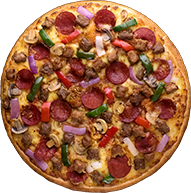 Six delightful toppings - beef, pepperoni, seasoned pork, bell pepper, mushrooms and onions. 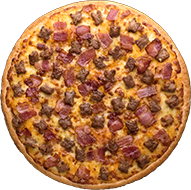 Beef, bacon and a triple layer of cheddar & mozzarella with a mild sweet sauce. 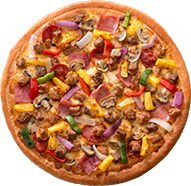 Italian sausage, sweet ham, bell peppers, onions, mushrooms and pineapples in our signature pizza. 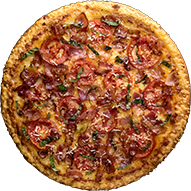 Tomatoes, basil and imported mozzarella, cheddar and cream cheese topped with bacon. 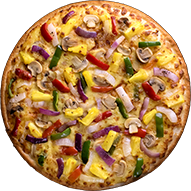 Crunchy bell peppers, mushrooms, chucky onions, and juicy pineapples on a double layers of mozzarella cheese. 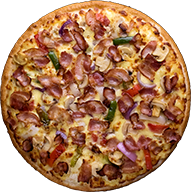 Two layers of toasted bacon with lots of bell peppers, mushrooms and onions with a mildly sweet sauce. 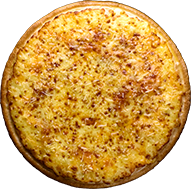 Mozzarella, parmesan and cheddar cheeses. 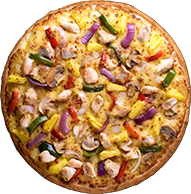 A cheese lover's delight. 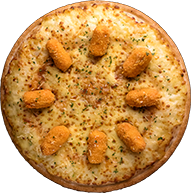 Mozzarella parmesan and cheddar cheeses, topped with bite-sized mozzarella sticks.